Since 1936, B.R. Kreider & Son has been the premier excavating and paving contractor in the Central PA region! We have the expertise, experience and, best of all, we provide a worry-free approach to your excavating and paving projects. With over 180 B.R. Kreider & Son dedicated, professional team members, we have the ability to react quickly and efficiently to deliver the very best results from start to finish. Our extensive work throughout Lancaster, Harrisburg, York, Reading, Lebanon and the surrounding areas means we understand the nuances of Central PA soil. "Everyone is completely satisfied with the work B.R. Kreider did. It looks fantastic. Your crew of guys did a great job of following not only our rules but your rules as well and it made for a safe and very good job." "Thanks for a great job at Valley View. Valley View had their dedication and open house yesterday. The owner is very pleased and the job looks great. Always a pleasure working with you. " "You guys don't just do good work...you're also good to work with!" "I wanted to let you know how pleased we all are with the job the BRK Team did on our recent Advance Auto project. Great team, personable, professional, and fine craftsmanship. Always a pleasure doing work with you guys!" "It is this type of work and cooperation that makes construction observation enjoyable to do, instead of a headache that it sometimes can be." "Thanks for the quick work at Palm Street for SACA. They were thrilled with how quickly (you) jumped on the project and knocked it out for them." "Thanks to you and the entire Kreider team for your patience, understanding and working with the Property Committee and staff through the last minute scope changes, scheduling your work around the access needs of various Camp programs and being cognizant to costs of the overall project." "B.R. Kreider still stands on the values and goals that they were founded on and my hat goes off to (them) for carrying on that torch and tradition. Thanks for the great job and I look forward to working together in the future." "I understand B.R. Kreider did the site work and excavating on the project, which is pretty impressive. The gentleman I was meeting with from Crossway spoke well of your company and the work you did. Congratulations on that job, it's quite a project!" "I just want to let you know that you have the best bunch of dirt and utility guys that I've had the pleasure to work with in many years. Great work ethic and positive personalities. It would give me great pleasure to work with your crew members again someday. " 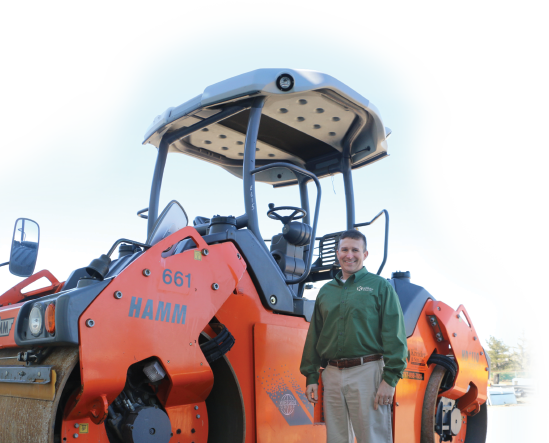 "On our recent paving projects, the B.R. Kreider team did a great job and showed professionalism every step of the project, starting with the estimate put together by Jay Miller, planning and scheduling by Lynn Nissely, Jr and on-site coordination by foreman Butch."